Age Criteria : Max Age 28 Years, as on 01-01-2018. Essential Qualification : Passed LLB/5 Year Integrated Degree in Law From any Recognized University. 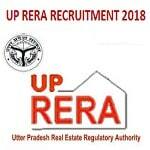 Eligible Candidates can Submit Application at the Official Website of UP RERA latest by 5th October 2018. Applicants First Logon to UP RERA Official Website. Click on Advertisement for Law Trainee in UP RERA.